This tiny, epiphytic crustose lichen of large twigs and branches would most probably need to be collected for certain identification. 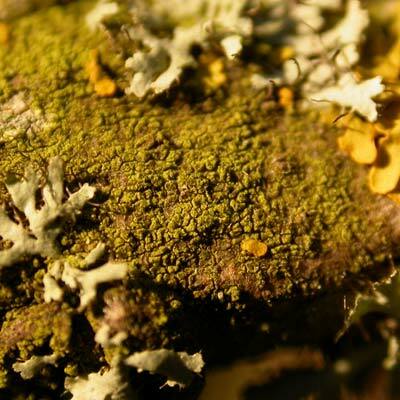 Although fairly well distributed, the small branches of acid-barked trees such as oak would first need to be scanned with a hand lens looking carefully in the gaps between foliose lichens for signs of the dirty grey-green, granular thallus and minute, convex, shiny red-brown to brown-black discs (0.2-0.3mm diam.). Under the microscope a squash of the disc will show the spores to be spindly and mostly seven-septate. Spores straight, slightly curved or spindle-like, seven-septate. Simms, M. J., (2016). Scoliciosporum chlorococcum (Graewe ex Stenh.) Vězda. [In] LichenIreland.